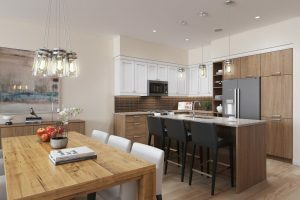 One of the revelations of living in a condo is that choosing less square footage doesn’t mean you necessarily have to make do with less – just that you need to be smart about how you organize the space you do have. And, once you go into “storage genius” mode, it tends to have a ripple effect – many smaller homes end up with as much usable storage area as places with a larger footprint, thanks to the space-savvy residents. Here are a few small space storage secrets that will come in handy no matter the size of your home. Go vertical. 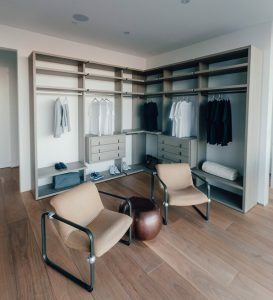 Eliminate clutter and open up your space with built in shelves, vertical shelving or wire racks hung behind doors for shoes, or cleaning supplies. Add shelving in corners or in the kitchen making it easy to access plates, cutlery and glasses. Think outside of the box. Be unconventional. Not all things need be stored in cupboards and drawers. The Spruce has some great tips on how to install a wall shelf in your home if you’re not sure where to start. One of the best investments from the get go is installing a closet organizer. Ikea has some fabulous ideas and some great DIY projects. You can easily double your storage capacity by adding double hanging, a bank of drawers and additional shelving. You can take the low end route with wire shelving and hanging or go for a more polished higher end product but either way, you will be surprised at how much more storage space you’ll have. Be sure to store shoes in containers (very inexpensive) so shoes don’t collect dust or carry dirt into your closet. The central hub of any home requires ongoing attention but there are so many organizing solutions that will keep it functioning like a well-oiled machine. From shelving in cupboards to stem racks for glasses, you can keep everything in its place and have a place for everything. Secret is, don’t over buy, keep food items small and get rid of expired product. You can install a slide out pantry shelf, use drawer organizers, or if you need more room for utensils you can install a pegboard with S hooks to hang them. Raise items off the counters by installing shelves. You can create a simple yet organized kitchen no matter how small. An inexpensive way to get things off the floor, counters and tables are hooks. Hooks at your front door for coats and jackets, umbrellas, even pots and pans. Use a pot rack and create more space in your cupboards. Hope you get hooked on this idea (wink). It’s simple and inexpensive. 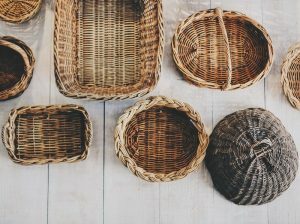 Baskets come in handy when you have too many of one thing and instead of scattering them here and there, find a home for them. Use baskets for office supplies; stackable plastic bins can be great for games, DVDs, etc; while baskets can be used for laundry, magazines, books and so much more. They’re great for the laundry room, to store clothes under the bed, for hats, gloves and scarves – the possibilities are endless. Group 3 or 5 baskets on a wall shelf adding a touch of style and décor. A great spot for baskets and bins is also on the top shelf of your closet where seldom-used items can be stored. A well-organized small space is truly the cat’s meow. Bigger isn’t always better and you don’t have to have a supersized home when you can live within your means quite comfortably in a condo. There’s no reason why you can’t have the coziness of a small space that also has style and functionality. Besides, done right, condos and small spaces are super cool when they are well thought out. Register with Pacific Landing today for more information on availability in our second Phase, The Douglas.